To purchase "He's An Old Cat" click here! "He's An Old Cat" complete album lyrics click here! "He's An Old Cat" track by track credits click here! "He's An Old Cat" video click here! Brian Gari has an inimitable style. His singing is fantastic combined with an emotional, beautifully flowing style on the piano. The stories he tells are straight from the heart. This CD is worth getting for the song "My Father's Cat" alone. What makes a great artist and composer is when someone writes songs that we can relate to, where the composer has the depth to understand the range of human emotions and expresses them succinctly in a song. This is Brian. It's uplifting, tender and a pure joy to listen to. If you haven't the pleasure of hearing Brian, I suggest you pick up this CD! 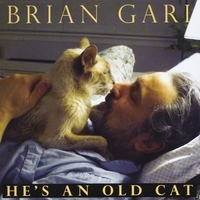 Brian Gari also offers an album devoted to the work of one composer/lyricist, in this case, himself. This charming collection is heavily influenced by the sounds of the 60s and '70s, everyone from Bob Dylan to The Beach Boys. As always with Gari's work, a large part of it appears to be autobiographical, featuring memories of childhood ("The California Dream"), past friends ("Laura's Dad") and romances, both sweet ("She Squeezes Me In") and sour ("Am I So Easy to Replace?"). On this album, there are even two songs devoted to important four footed friends (the title track and "My Father's Cat"). Gari shares vocal honors on the album with several "guests," including Elynn Diamond, Peter Anders and Don Ciccone. All offer pleasant vocal contributions in the pop style of the album. This is one of those collections that slides by easily and will bring some smiles as you relax and listen. There is also a charming photo on the cover of the star and, presumably, the feline who inspired the title song. this wonderful new album makes it worth the wait!!! I adore this collection of some new songs as well as some older material. "Am I So Easy to Replace" is one of the catchiest songs you'll ever hear and "My Father's Cat" will break your heart. I am so very happy to have a recording of "Letter To Norma" which I have heard only on a video. It's a brilliant song!!! I also love the original version of "Bicycle Ride" which is truly a lost treasure. That's only a few of the great songs in store for you on this exciting CD. I just got the CD yesterday and have played it several times already. I can't wait for Brian Gari's next CD. and put me in a wonderfully nostalgic mood. had the video posted on their page. so that song was particularly poignant. I downloaded it from itunes! It's a really heartwarming song and video. I also posted it to my page and sent it to some friends who also have older pets. It's wonderful. The production is bright and clean. You are in good voice. And as always I like your melodies...your melodic sense tickles mine. I'm listening to your Cat cd right Now. Very good job. "I Hope I'm Getting Close" is touching. I hope you do many more cds. Brian--your songs are so good, touching, thoughtful, evocative, sweet & sensitive.. The title song is great---really upbeat and sweet. I LOVE the California Dream--that really hit me...really nice song. My Father's Cat...so good...really made me cry! Good stuff, Brian. I particularly like both "Cat" songs and what I call "The Brill Building Song". Hope you sell a million. Loving the new cd. Great job! I am so impressed...it is one of the most poignant, diverse & textural sound experiences. It moves so well from mood to mood--what great music! gorgeous, very touching and wonderful...we feel this album is amongst your finest work ever. I received the CD today.. and it's got such a great feel to it.. I just had to put it on the iPod. Great songs, thanks so much... it's an instant favorite. My favorites are "If I Ever End up with Quinn" and "I Hope I'm Getting Close"
two total hits to me, beautiful Brian, thanks! I like Face To Face a lot and of course, My Father's Cat. Brought tears to my eyes even without the video! Congratulations on another well done CD. You have a way of writing words that I can relate to from past relationships and experiences. What I like about your writing is that it zeroes in on the human experience, our encounters. from the heart and gut and different because of that. ...truly an impressive songwriter. As a decades-long fan, I have enjoyed all of his music, but this one has risen to the top of my list. This wonderful, eclectic collection showcases his beautifully crafted melodies and insightful lyrics in addition to his versatility. and don't know it!...that's why you're hysterically funny! I like your use of voices too (of course) Your songs are very accesible and 'hooky'... congratulations!